Your ISA, your future - Time to reimagine how to invest more tax-efficiently? When it comes to tax, leaving important planning to the end of the tax year can cost thousands. So now is your last chance to get your tax affairs in order before the end of the 2018/19 tax year. We’ve provided a summary and tips for some of the key tax and financial planning areas which may be appropriate to certain taxpayers and should be considered prior to the end of the tax year on Friday 5 April 2019. Tax planning might not sound very exciting, but it can have a dramatic effect on your personal finances. Creating and maintaining the right investment strategy plays a vital role in securing your financial future, whether you are looking to invest for income, growth or a combination of the two. Life doesn’t stand still, so your financial plan shouldn’t either. We often think of investment goals in terms of a single investment strategy, but in truth they really require several strategies, each tailored and based on your specific goals. However, not all financial goals can be met with a single investment strategy. Individual Savings Accounts (ISAs) are an incredibly effective means of shielding your money from both Capital Gains Tax and Income Tax. Using your tax-free allowances every year should be a standard part of your financial planning. Each tax year, we are each given an annual Individual Savings Account (ISA) allowance. This can build up quickly, letting you accumulate a substantial tax-efficient gain in the long term. Creating and maintaining the right investment strategy plays a vital role in securing your financial future. How much control do you want over your investments? We can advise you on solutions to help you meet your investment goals so that you weather the markets by keeping your portfolio diverse. Living for another 30 years after work isn’t just a possibility, it’s a probability. Whether retirement is many years away or just around the corner, unless you start planning for retirement now, there is a great danger that you could outlive your savings. The earlier you start planning, the easier it will be to create the retirement lifestyle you want. It is difficult to comprehend that you would ever lose the ability to manage your own affairs, but mental and physical incapacity can happen to anyone at any time. In England and Wales, a Lasting Power of Attorney (LPA) is a legal document that allows you to appoint one or more people to make decisions on your behalf during your lifetime. Planning for One of the Biggest Social Challenges in the Coming Years. Have you thought about the cost of care in later life? One of the biggest challenges of the 21st century is Britain’s ageing population. If your business partner or a shareholder died or became critically ill, have you ever thought what the impact could be? The loss of a business partner or a shareholder can have a major impact on the success of any business. Creating a strategy for your investments that match your goals. Investing can be intimidating, a complex world with its own language. But by recognising and meeting your distinct requirements, we can have a positive impact on your life and investment objectives and help you through the entire process. Taking greater control of your retirement plans for the future. It is essential that you start to plan for your retirement as early as possible so that you are able to live comfortably in the knowledge that your lifestyle needs are covered. This will mean careful consideration of your pension fund throughout your working life. To find out more about setting up Self-Invested Personal Pension, please contact us, and we’ll arrange a meeting to discuss your requirements. Welcome to our Guide to Protection Planning. Inside we look at the number of key areas that will empower you to put in place an effective protection planning strategy to preserve and protect your wealth for you and future generations. There are many things to consider when looking to protect you and your family – premature death, Inheritance Tax, illness and loss of income, to name but a few. These events all need to be considered in an effective protection planning strategy. To review your situation, please contact us – we look forward to hearing from you. Reflecting your future capital or income needs. Don’t let a lifetime’s savings and investments be lost in moments. Fraudsters are getting more deceitful and ever more successful. Pension and investment scams are on the increase in the UK. Everyday fraudsters are using sophisticated ways to part savers from their money, and the Internet and advances in digital communications mean these kinds of scams are getting more common and harder to identify. A lifetime’s savings can be lost in moments. Take the time to think about what you really want from your investments. The sooner you start investing, the better off you will be. This is a simple truth, and it is based on the fact that even the most conservative investments grow on a compound basis. Creating the opportunity to enjoy your life after work. Welcome to our Guide to Retirement Planning. In recent years, retirement has become more about the opportunity to enjoy your life after work. Your finances are a huge part of achieving that. With the maximum State Pension currently £8,546.20 (2018/19) a year, you’ll need to decide if this is going to be enough for you to live on when you retire. The key changes to existing policies and newly introduced initiatives. Now that we’ve entered the 2018/19 tax year, a number of key changes have taken place to existing policies, along with some newly introduced initiatives. It’s important to consider these tax implications when making financial decisions. When we die, we like to imagine that we can pass on our assets to our loved ones so that they can benefit from them. In order for them to benefit fully from your assets, it is important to consider the impact of Inheritance Tax. Don’t let global uncertainties affect your financial planning for the years ahead! Helping you create the life you want! No two people have identical financial circumstances, which is why it’s essential you have a custom financial planning solution that meets your individual needs and goals. Planning for financial success can be complicated in today’s world. A broad knowledge of everything from complex retirement and investment products to risk management strategies and tax laws is required. Financial resilience and peace of mind for individuals and households! If you were one of the million people in the UK each year that find themselves unable to work due to a serious illness or injury, how would you cope financially? The Association of British Insurers 2017 findings highlight the fact that of these, many find it difficult to survive on their savings or on sick pay from work. Passing on your wealth in the most tax-efficient way. Welcome to our Guide to Estate Preservation. Wealth transfer has become an important issue for many families today. Individuals with assets of any size should prepare for their eventual transfer whilst making provision for any tax or legal consequences. Don’t miss the chance to make the most of valuable tax-efficiencies and allowances! It’s important to take the time to give your finances a year-end check-up. The 2017/18 tax year ends on 5 April 2018, with the new tax year beginning the following day, on 6 April. These are important dates for financial planning, so it’s important you don’t miss the chance to make the most of valuable tax-efficiencies and allowances. Divorce and pensions are very significant. A pension could be a couple’s most valuable matrimonial asset, in some cases worth more than the equity in the family home. As such, it is important that pensions are considered in the financial settlement if a couple decides to divorce or dissolve their registered civil partnership. All the money you’ve saved into it (except for your basic State Pension) will be taken into account when your assets are divided. Stock markets may be a riskier home for your savings, but higher rewards may be possible if you plan and take a longer-term view. Over longer periods, stocks and shares tend to deliver a superior return to cash, despite periodic bouts of volatility. Whether you’re a relative, parent, grandparent or a friend, investing for a child’s future is one of the most important things you can do. For any investor, time is a powerful ally – so where you are investing on behalf of children, you start with a great advantage. Family succession planning is a journey that should commence the day you start your business, but often only commences with a trigger – in other words, something that has initiated the decision to start the succession process. It may be one of the most challenging experiences facing any business leader, especially an entrepreneurial business person who has built a family business from scratch, so it is crucial to get right. It’s a concern for many people how they will pay the cost of care either for themselves or for a loved one. The reality is that most people will be expected to pay something towards these costs. With the UK’s population ageing, more people will be living with longterm care needs. Rising inflation is a concern to investors, as changes in inflation and interest rates affect various asset types in different ways. This is an especially important issue for retirees living on a fixed income. How will you ensure you achieve the retirement lifestyle you deserve? The pension freedoms rule changes mean that we’ll be increasingly in charge of our pensions, both while we’re building up our retirement pot and when we start to draw an income. It’s therefore more important than ever to plan our retirement saving from an early age. The start of the new tax year on 6 April 2017 saw the launch of the Lifetime ISA (LISA), which was announced in the 2016 Budget. This is a new type of Individual Savings Account (ISA) designed to help you save for a first home or for your retirement at the same time. To be eligible, you have to be aged between 18 and 39 years old (up until your 40th birthday). What could it mean for UK investors? You’ve worked hard all of your life to get to where you are, and providing for those you care about is important to you. However, just owning your own home and having sufficient capital to provide a reasonable income during your retirement may leave your estate with a sizeable IHT liability. If you want to have control over what happens to your assets after your death, effective estate planning is essential. After a lifetime of hard work, you want to make sure you protect as much of your wealth as possible and pass it onto the right people. As we approach the end of the 2016/17 tax year, have you fully utilised your annual Individual Savings Account (ISA) allowance? The ISA limit for 2016/17 is £15,240, rising to £20,000 in 2017/18. Anyone wishing to utilise their allowance should do so before the deadline at midnight on Wednesday 5 April 2017. The date marks the end of the 2016/17 tax year. It is a ‘use it or lose it’ allowance, meaning that if you don’t use all or part of it in one tax year, you cannot take that allowance over to the next year. The start of a new year enables you to reassess and critique your financial plans and goals to ensure that you know where you are and where you should be. It means you can also put in place new strategies or update existing ones to achieve the outcomes you are expecting. It means you can work towards and meet deadlines and allocate sufficient time to completing these financial objectives. After a game-changing 2016, the investment environment was not only mixed but characterised by uneven global growth and political events such as Brexit and the US elections. Many of the drivers that affected markets in 2016 will almost certainly remain the focus for 2017. Effective tax planning is about knowing the taxes you are liable to pay and acting to legally minimise them. It is also about maximising your net income and creating opportunities to invest and save tax-efficiently. While there is no doubt that the tax system is complex, you should not let complexity deter you from a simple goal: keeping your taxes as low as possible. With the busy lives we lead, it can be difficult to find the time to keep fully up to speed with everything that’s going on, including managing our ever-changing financial affairs. Especially when you also add to this that investment products are unlikely to remain the same throughout our lifetime, this is where professional financial advice can prove invaluable. Anything is possible when you manage your money the right way. Whatever your goals in life are, careful planning and successful investing of your wealth can help you get there. Investments can offer both risk and return, and generally the bigger the risk the greater the potential return. It’s down to each investor to be comfortable with the perfect balance for them, and this will vary depending on how much you have to invest, what stage of life you’ve reached and what you’re trying to achieve. Whatever your goals in life are, careful planning and successful investing of your wealth can help you get there. Whether you want to generate an income that supports your lifestyle, family and retirement plans; need help to pass your wealth on to future generations; or fund your ambitions, from personal legacies to philanthropy. The right professional financial advice can give you the freedom to live life on your terms, and key to this is safeguarding your financial security by making sure you have adequate protection in place to care for the people and things that matter. What could the further reduction mean to your retirement income? The Government has introduced comprehensive reforms to the pension rules over the previous few years. One important change, which may have been overlooked by some savers, is the reduction of the Lifetime Allowance that applies to pension savings. This further reduction means that you may be affected. What's better - active or passive management? If you are looking to invest in shares or bonds, you may think about putting your money into one or more managed funds. Managed funds are pooled investments that contain different securities, so you reduce the risk of holding just a few individual shares or bonds. Once you’ve decided to start saving for retirement, you need to choose how to do so. Pensions have a number of important advantages that will make your savings grow more rapidly than might otherwise be the case. Following the biggest reforms to pensions in recent times, whilst the ability to unlock pension pots is attractive you also need to understand the tax implications of doing this and accept the risk of ensuring that the funds built up are managed effectively to ensure that they last for life. The State Pension changed on 6 April 2016. If you reached State Pension age on or after that date, you’ll now receive the new State Pension under the new rules. The aim of the new State Pension is to make it simpler to understand, but there are some complicated changeover arrangements which you need to know about if you’ve already made contributions under the previous system. In the March 2016 Budget, the Chancellor announced major improvements to Individual Savings Accounts (ISAs) with the introduction of a new Lifetime Individual Savings Account (LISA) from April 2017, designed to help young people save flexibly for the long term throughout their lives. The aim is to help them simultaneously save for a first home and for their retirement without having to choose one over the other. Chancellor of the Exchequer George Osborne delivered his eighth Budget speech on Wednesday 16 March, his third in 12 months. In our summary of the key announcements, we consider how they could impact on your finances today and in future years to come. Protecting your assets to give your family lasting benefits. Contrary to the belief of some, Inheritance Tax not only affects the very rich, but other people may be liable without realising. Few taxes are quite as emotive – or as politicised – as Inheritance Tax. The structures into which you transfer your assets can have lasting consequences for you and your family. We can help you choose structures and trusts designed to protect your assets and give your family lasting benefits. Unlock what the additional reforms could mean to you. Pensions have been transformed by the arrival of freedom reforms on 6 April 2015 which now give far greater flexibility over what you can do with your pension pot. The new freedoms mean you can enjoy far greater choice on how you spend and generate an income from your pensions, but with further changes on the horizon these are some of the key changes you need to know. Optimising your tax position is paramout in the run-up to the financial year end. Whether it’s the new rules on pensions, savings or taxable dividend income, we have set out what you need to consider in the run-up to the financial year end. Essential tax and wealth strategies. Tax is a highly sensitive subject for most individuals. In this guide, we consider a number of tax planning and wealth strategies. The start of a New Year is the perfect time to take stock and think about how you can improve your financial position and ultimately structure your affairs so that you don’t have to pay more tax than you legally have to, especially as we’re in the run-up to the tax year end on 5 April 2016. Successful long-term wealth creation requires the right balance between shares, bonds and other investments. In Guide to Investing in 2016, we consider a number of different solutions available to you, and each section explains the basic facts. On Wednesday 25 November 2015, Chancellor George Osborne presented his Spending Review which set out what government spending will be over the next four years, while the Autumn Statement updated his plans for the economy. Investing and saving for your children or grandchildren is a great way to give them a good financial start in life. Even small amounts can really add up if you save regularly from a child’s birth, and there are many ways to invest on behalf of a child. No one likes to think that something bad will happen to them, but if you couldn’t work due to a serious illness, how would you manage financially? Could you survive on savings or sick pay from work? If not, you may need some other way to keep paying the bills – and you might want to consider income protection insurance. After a lifetime of hard work, you want to make sure you protect as much of your wealth as possible and pass it to those who you would like to receive it. Wealth, just like your health, must be carefully preserved, and the correct solution for you is the one that suits your personal circumstances. Following the biggest reforms to pensions in recent times, whilst the ability to unlock pension funds is attractive, you need to understand the tax implications of doing this and accept the risk of ensuring that the funds built up are managed effectively to ensure that they last for life, however long that may be. Unlocking cash in your home - is it right for you? We all look forward to the day when we can stop or cut down on the amount of time we spend at work and all of the things we’d like to do once we’ve retired. If you’re facing a pension shortfall or need to meet an unexpected expense, equity release may be an option to consider. It allows you to unlock some of the wealth you’ve accumulated in your property without having to move. But before you consider taking this option, there are key aspects of it that you need to know. Whether you’re saving for old age, about to retire or already have, you need to give your pension some attention following the announcement of the new pension freedom reforms. Perhaps most important of all were the changes announced in the 2014 Budget, which mean many more will now be able to retire and withdraw money from their pension without buying an annuity. ‘Don’t put all your eggs in the same basket’ is probably the best known proverb advising investors about the importance of portfolio diversification to spread and reduce risk. In this guide, we look at ways to protect your portfolio by spreading your risk across several different asset classes and some of the many different assets in which you can invest, each with different risk characteristics. In his final Budget before May’s general election, the Chancellor of the Exchequer, George Osborne, announced tax cuts for first-time buyers, workers and savers, and claimed Britain was ‘walking tall again’ after five years of austerity. In our Budget 2015 Summary, we have provided information about the key announcements but primarily look at the main areas around financial planning. The new government pensions freedom rules came into place from 6 April 2015. It’s really important to understand the changes and review your options, because from the age of 55, you can now take responsibility for the money you’ve saved and access your pension pot however you like. Most people will now have more options when it comes to their retirement choices. But generally they’ll still want their pension income to last their lifetime – so careful planning is a must. Few taxes are quite as emotive – or as politicised – as Inheritance Tax (IHT). The structures into which you transfer your assets can have lasting consequences for you and your family. We can help you choose structures and trusts designed to protect your assets and give your family lasting benefits. Chancellor George Osborne delivered his Autumn Statement 2014 to Parliament on 3 December last year. While it was viewed by many as representing a political success for the Chancellor, the Office for Budget Responsibility (OBR)’s forecasts were seen as providing a sober reminder of the fiscal constraints that the winner of the May general election faces. The Government's flagship pensions freedom policy comes into force on 6 April 2015 and will give far greater flexibility over what someone can do with their pension. Whether you are heading for retirement or already a pensioner, the changes could affect you. The new rules give considerable freedom of choice. It has never been more important to ensure that you make the right choices about your pension pot, as these decision will affect you for the rest of your life. If you are keen to take advantage of the New Individual Savings Account (NISA) allowance, increased to £15,000, and make the most of your tax-efficient savings, time is running out. You only have until 5 April to fully utilise your 2014/15 NISA allowance, after which it will be lost forever. See our guide to find all about the current state of NISAs and what they can do for you. As wealth grows, so too can the complexity of its management. In this guide, we look at different ways to create, conserve and enhance wealth. We are able to offer you bespoke solutions at every stage of your wealth planning cycle – from maintaining liquid cash reserves and managing wealth as it grows, to finding the best ways to preserve and pass on the wealth you have created. If you’re one of the millions of Britons approaching retirement age or wishing to retire early, it can be worrying and confusing. Inside our guide, whether your retirement is in the far distance or just round the corner, to enable you to secure your financial security and independence during your retirement, we look at the areas you need to consider sooner rather than later. Inheritance Tax (IHT) in the UK may be one of life’s unpleasant facts, but with the appropriate IHT planning and professional advice, we could help you pay less tax on your estate. The aim of this guide is to provide a brief outline of IHT, a subject that was once something that only affected very wealthy people. The aim of this guide is to give a brief outline of asset allocation, an investment strategy that attempts to balance risk versus return by adjusting the percentage of each asset in an investment portfolio according to the investor’s risk tolerance, objectives and investment time frame. Welcome to our Guide to Wealth Protection. The security and opportunity your wealth brings can be protected for generations, but there are many things to consider when looking to protect you, your family and your wealth. Inheritance tax, premature death, illness and loss of income to name but a few all need to be considered in an effective wealth protection planning strategy. The number of people divorcing in later life is increasing, and it’s not just putting couples under emotional strain but it’s also potentially harming their retirement plans. Achieving a fair resolution of all the financial issues surrounding divorce or the dissolution of a registered civil partnership can be highly stressful. Exploring your ISA options - Time to give your financial future a boost? Transferring ISAS - Time to bring your investments together? Making the most of your pensions - Have you accumulated multiple plans that need reviewing? Retirement wealth - What’s the right answer for you? Tips to minimise the tax you pay - Have you utilised your tax planning deadline opportunities? New State Pension age - How will it affect your retirement plans? Shopping around for a better deal - Consumers lost £130 million by sticking with the same pension provider in 2016. Road to Brexit - Biggest investment planning challenge over the coming years for all investors. Protecting your finances and well-being - Millions of Britons face financial fallout should serious illness strike. Pension freedoms - Retirement savers say they are still confused by the rules. Safeguarding wealth for future generations - New Inheritance Tax rules apply from 6 April 2017. A little today, a lot tomorrow - Managing investment risk during turbulent markets. Looking to the future - Cost of essentials is the most common perceived threat to over-55s. Delegating Power - When you are unable to make your own decisions. Top Trump - Winners and losers from the seismic US election result. 2016/17 Year End Planning - Keeping your taxes as low as possible – what you may wish to consider sooner rather than later. Investment Outlook - Taking advantage of opportunities in 2017. Navigating Your Investment Options - How professional financial advice can prove invaluable. Money's Too Tight To Mention - Planning financially for long-term sickness. Consolidating Your Pension Pots - What you need to consider to ensure you don't lose out. Pension Reforms - How the lifetime allowance reduction could impact on your retirement savings. Investment Matters Post-brexit - Facing new challenges at every turn to meet long-term objectives. Empty Nest, Empty Wallet - Parents putting financial health at risk to fund university costs. 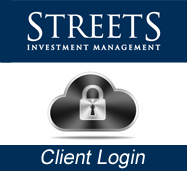 Streets Financial Consulting PLC is authorised and regulated by the UK Financial Conduct Authority (FCA) and is entered on the Financial Services Register (www.fca.org.uk/register) under reference 116445. Email communications are not secure for this reason Streets Financial Consulting PLC cannot guarantee the security of the email or its contents or that it remains virus free once sent.